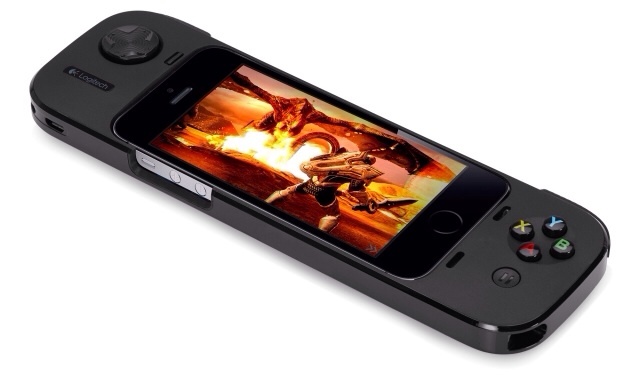 Logitech has launched the PowerShell Controller + Battery which provides console-style game controls and increasing game play-time on your iPhone 5s, iPhone 5, or iPod touch (5th generation) running iOS 7. To use this first-of-its-kind mobile gaming console, you simply insert your compatible iPhone or iPod touch into the controller as you would with a standard case. The analog off-screen controls of the Logitech PowerShell Controller + Battery deliver a gaming experience that's familiar to console players everywhere, with a D-pad, shoulder triggers and face buttons that allow you to control game play. As a result, you can use the entire screen for viewing the game, giving you a more immersive mobile gaming experience. And thanks to the controller's comfortable shape, you can play for longer periods. The portable controller maintains a profile that fits easily in your pocket or small bag — putting intensive, complex games within your reach wherever you are. "We designed this controller to deliver a true console-gaming experience on an iOS 7 mobile device," said Ehtisham Rabbani, general manager of the Logitech gaming business. "With gaming so pervasive on the mobile platform — our research shows that 87% of iPhone and iPod touch users play games on their device — it's time to revolutionize the experience." With your iPhone or iPod touch in the controller, you maintain full access to power on/off, volume, camera, speakers, headphone jack and charging. And your controller's 1500 mAh battery increases the battery capacity of your iPhone 5s, iPhone 5 or fifth-generation iPod touch. Additionally, you can recharge both batteries without removing the phone from the controller. The controller is compatible with the iOS 7 game controller framework for which a long and rapidly growing list of popular games are supported, including Bastion, Fast & Furious 6: The Game, MetalStorm Aces, Galaxy On Fire 2 HD and Nitro, among others available from the App Store. The Logitech PowerShell Controller + Battery is available online beginning today for $99.99 at BestBuy.com and the Apple Online Store.